Anna Hazare and his Jan Lokpal Bill is big news. Seldom does a country come across a man with such concrete determination. His views and beliefs are what comprise of the scarce ethics our country holds on to. Believing in change and working towards it is one amazing feat, irrespective of whether results are obtained or not. Hats off to this hero, who has promised to fast unto death unless the Jan Lokpal Bill is passed. May god be with him and may he succeed. Deriving a solution for the biggest malfunction in our system seems to be elementary. Or is it? This problem has strings attached. Not one, not two but 1.2 billion of them. Eradicating the stigma of corruption from the country is tedious, if not impossible. The question which pops up in my mind is ‘Is it us?’. 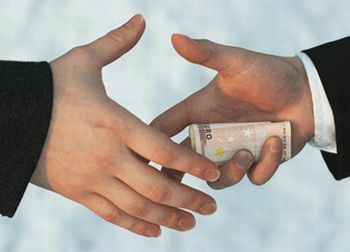 Every person in the country has been involved in either bribing or getting bribed. The youth complain that the government officials do not function efficiently. That may be the problem here. Not corruption on the whole. A corrupt official is not complete without a person helping him getting the label of corrupt. We want land sanctioned. The clerk takes his time. We want it done quickly. Out comes the hand from the pocket and under the table. The clerk doesn’t demand it and we can’t wait. College boys caught drunk driving. Dad comes and slips a stealthy hand into the constables pocket and LO! The spoilt brat is out of trouble. This is when we know the answer. It is us. Very rarely we hear about a government official harassing someone for a bribe. Not that is doesn’t happen. It does with no seam of shamelessness. Succumbing to that is our fault again. It is us. As I was writing this impromptu piece I got to know that democracy has won. Like I said, Hats off to the solidarity of this 78 year old man. But is this the beginning of the end or just a minor bump in the workings of the “jugaad”? If Anna only stood for popularity, and passing of the bill, he has succeeded already. But if he, along with several thousand students, stood for complete eradication of the sickness known as corruption, I believe the wait is long. And the wait will end only when WE want it to end. Obeying the rules should be the order of the day. Stricter working norms for officials should be the order of the day and not simple, accessible ‘jugaad’. My views on a piece of paper aren’t changing anything. The will to change has to be within us. So cheers to democracy, the youth, Anna and last but not the least…Jugaad.